iPhoneRepairBaseBlogiOSAre the iPhone 7, 7 plus and Apple Watch waterproof? What is IP67, IP68 water resistance? Since the Apple iPhone 7, iPhones come with an IP67 to IP68 dust and waterproofing certification. BUT before you would dig yourself deep into underwater photography, it’s good to note, that this rating is “advisory only”. How waterproof is the iPhone 7 or 7 plus? Question: Can the iPhone 7 go underwater? Answer: The Apple iPhone 7 is not waterproof, but is water resistant. Water resistant means the phone could easily survive a splash of water, or a quick dip into water. In fact, as the small print for the newer iPhones make it perfectly clear, liquid damage is not covered under warranty. What does IP67 / IP68 water resistance mean? The “not recommended” bit is explained a bit more by understanding what is meant by IP67 and IP68-level certification. The “IP” part stands for International Protection marking, referring to a standard created by the International Electrotechnical Commission (IEC). 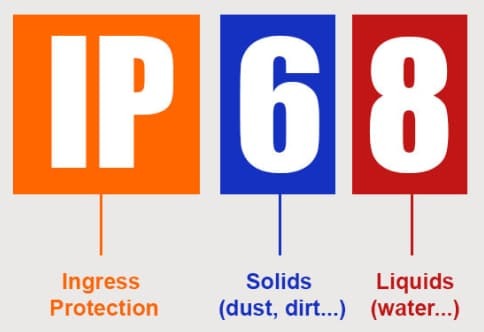 The “6” of IP67 refers to the device’s dust-resistance level, along with sand and dirt. This means that in an eight-hour test, there was “no ingress of dust” for the device. The “7” and “8” digit relates to the relative waterproofing of the device, which refers to protection against, “ingress of water in harmful quantity … when the enclosure is immersed in water under defined conditions of pressure and time (up to 1m of submersion for the “7” and up to 2m for the “8”).” The newer iPhones should be protected against being submerged in “fresh” water for up to 30 minutes. Finally, that’s everything you need to know about the difference between IP67 and IP68 water resistant meaning. Never charge a wet phone! However, Apple notes that, “Splash, water and dust resistance are not permanent conditions and resistance might decrease as a result of normal wear,” warns users against charging a wet phone, and points out that liquid damage is not covered under warranty. Apple also warns that seals against water resistance can weaken over time, which is another reason why it’s best not to deliberately expose iPhones to moisture. In general, though, the iPhone 7, iPhone 7 Plus, iPhone 8, iPhone 8 Plus, iPhone X, iPhone XS, iPhone XS Max, and iPhone XR will hold up to accidental splashes of water and rain. Waterproof Apple watch for swimming? The Apple Watch Series 4, also newly announced, continues to feature the same water resistance rating as the Apple Watch Series 3. It has a water resistance of rating of 50 meters under ISO standard 22810:2010. That means the Apple Watch Series 4 is suitable for shallow-water activities like swimming in a pool or an ocean, but it should not be used for scuba diving, water skiing, or other activities that involve exposure to deep water or high-velocity water. So even after Apple increasing its water resistance for the iPhone XS and XS Max, it’s still a gamble to do so! If you ended up with a wet phone, and had to realise your iPhone is water damaged, there’s still hope for you! We carry out water damage repairs daily in our workshop, and most of the time we can fully restore the device into working condition. Of course, it’s good to know what to do if you accidentally expose your device to any liquid. A few quick steps can prevent further and greater damage to the device while it gets to us for the professional repair. Only a friendly reminder: placing your device into rice will only make it worse 😉. You can read our blog entry to learn more about what to, and what not to do with a freshly soaked iPhone. What to do if you drop your iPhone in water or other liquid?